Researchers at Kanazawa University report in Proceedings of the National Academy of Sciences of the United States of America (PNAS) that a particular signaling pathway in breast-cancer tumors causes cancer cells to divide symmetrically, expanding the tumor. Inhibiting the pathway by drugs could become a strategy for eliminating the cancer cells. In breast cancer, one of the most common cancers in women, tumors contain a small amount of so-called cancer stem-like cells (CSCs). Being able to eliminate breast-cancer stem-like cells in a targeted way is essential for developing successful therapies - conventional treatments, such as chemotherapy or radiotherapy followed by drug intake, do not target CSCs. A better understanding of the processes generating CSCs in breast-cancer tumors is needed. Noriko Gotoh from Kanazawa University and colleagues have now uncovered a signaling pathway directly related to the proliferation of CSCs in breast cancer. A property of stem cells is that they can self-renew and differentiate. Two types of stem-cell division can occur: symmetric or asymmetric (Fig. 1). In the former, two self-renewing stem cells are generated; in the latter, only one (and a differentiated cell). It is now believed that malignant CSCs have a higher tendency to divide symmetrically, thus increasing the number of CSCs. Gotoh and colleagues looked at how the microenvironment of CSCs, called the CSC niche, causes and sustains an increased rate of symmetric division. The researchers started from the observation that a particular gene encoding a type of cytokine known as Semaphorin 3 (Sema3) was one of the most-expressed genes in the CSC niche (Fig. 2). (Cytokines are small proteins that, when released, affect the behavior of cells around them.) The production of Sema3 activates another protein, called MICAL3, the expression levels of which were also found to be high in the CSC niche. Having established this important pathway is highly relevant for developing treatments for breast cancer, because, quoting Gotoh and colleagues, "by inhibition of MICAL3 … or knockdown of each component in the signaling pathway, the symmetric cell division may be inhibited, leading to a reduction of breast-cancer stem-like cells." 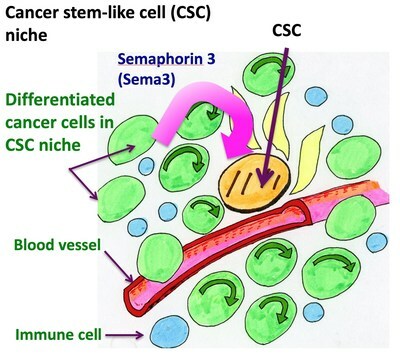 A cancer stem (or stem-like) cell (CSC) is a cancerous cell with the property that it can differentiate in various cell types found in a particular cancer sample. CSCs are tumor-forming and resistant to radio- and chemotherapy. New cancer therapies targeting CSCs are being developed, as CSCs are involved in cancer metastasis and tumor relapse. 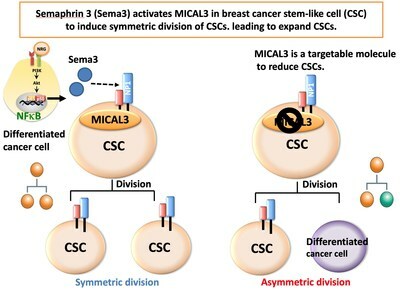 Noriko Gotoh from Kanazawa University and colleagues have now shown that a particular mechanism causes the CSCs in breast cancer to increasingly divide symmetrically, thereby each time creating two CSCs. A signaling pathway describes the signal transduction process in which a chemical or physical signal is transmitted through a cell as a sequence of molecular events - typically, biochemical reactions involving proteins. In a signaling pathway, groups of molecules work together to control cell functions, like cell division or cell death. The abnormal activation of a signaling pathway can sometimes lead to cancer. A strategy for preventing cancer due to abnormal signaling is to develop drugs that block the pathway. Gotoh and colleagues have now discovered a signaling pathway that links the release of particular proteins to the stimulation of symmetrical CSC division in breast cancer.